August, the last month of meteorological summer, continued the streak of above-average monthly temperatures. Numerous areas within the mid-Atlantic saw near to just above half of the days of the month above 90 degrees, though New England had their fair share of hot and humid days (Boston and Hartford each reached a high of 98 degrees on August 12th!). 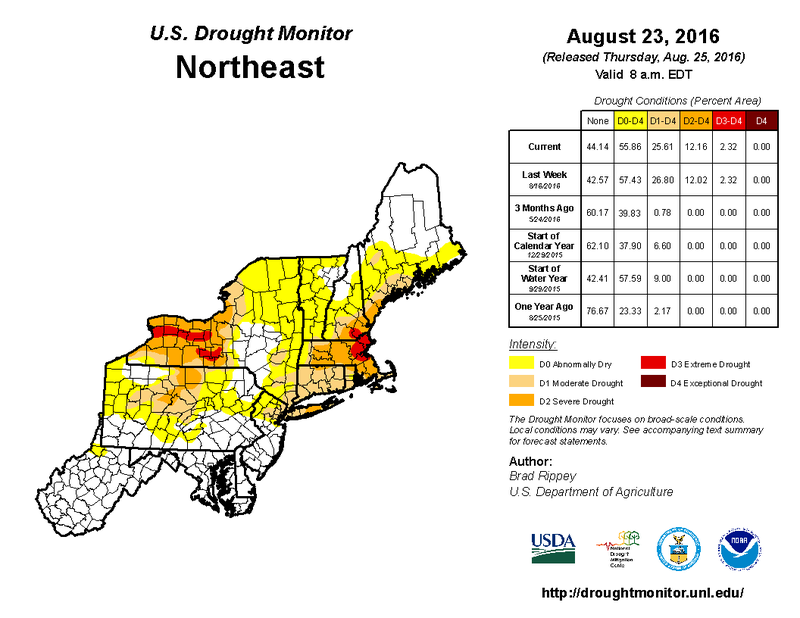 Northern New Jersey through southern New Hampshire are still experiencing abnormally dry to drought conditions. Northeastern Massachusetts and southern New Hampshire have been the driest, dipping into an extreme drought this month. In terms of severe weather and extreme flooding, August was nowhere near June or July's standards, however, there was the Waterville, NY and North Haven, CT EF-0 tornadoes on the 10th, as well as the Concord, MA tornado on the 21st that downed plenty of trees and power lines along its path. Rainfall has been well below average for the month across much of the region. This resulted in parts of New England slipping into an extreme drought (in red in the picture below), forcing cities and townships to tighten up their water conversation policies, such as mandatory restrictions on watering lawns and urging residents to take shorter showers. Across the rest of the abnormally dry to drought-stricken regions, trees and grasses are noticably yellowing or browning. Only south-central PA, Maryland, and extreme northern Virginia were spared from the rainfall deficit, coming up near to above average in terms of rainfall. Most recent drought monitor map (August 23, 2016) for the northeastern United States, courtesy of the U.S. Department of Agriculture. Actual versus normal rainfall for the month of August 2016; New Jersey thru Massachusetts and Richmond, VA are currently experiencing a deficit, while other areas like south-central Pennsylvania thru northern Virginia are slightly above. For those who weren't a fan of July's heat, August brought no repreive, either. Average monthly high temperatures were well above average across the Northeast and mid-Atlantic, with non-coastal regions seeing 90 degrees or higher for about half of the month (keep in mind that an easterly or southerly component of the wind can help cool Boston and John F. Kennedy Airports considerably compared to inland areas). Although it is not yet official, August 2016 and the summer as a whole looks to be the hottest on record for the United States. Average and actual monthly high temperatures, along with the number of days that featured 90 degrees or higher for the month of August. The red signifies that the average monthly high temperature was above normal for the month of August. In terms of severe weather, Long Island and coastal Connecticut certainly took the brunt. On August 10th, a cold front pushed through the region, bringing scattered showers and thunderstorms. However, before the line even reached Connecticut and Long Island, a notable meteorological feature could be seen on radar across northeastern Pennsylvania: a Mesoscale Convective Vortex, also known as an MCV. Although it typically will not produce severe weather on its own, the low-pressure center pulls winds into a circulating pattern that gives it a swirling appearance, and could transfer these rotating winds and energy into thunderstorms. This is exactly what created the Waterville, NY and North Haven, CT EF-0 tornadoes, as well as additional damaging wind reports across the rest of coastal Connecticut and Long Island. The Mesoscale Convective Vortex that facilitated the two tornadoes in Connecticut and Long Island later in the day. 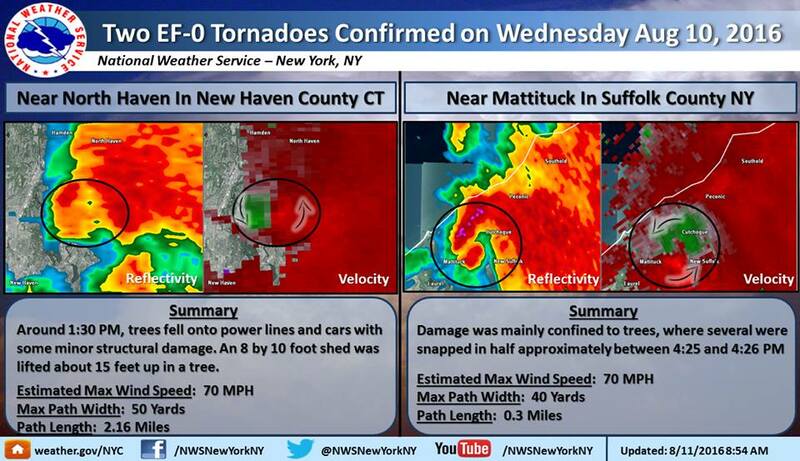 Summaries of the two EF-0 tornadoes that occurred in North Haven, CT and Waterville, NY on August 10th. Image courtesy of the National Weather Service in Upton, NY. Central Massachusetts had their own tornado later on in the month on August 21st. Strangely enough, this tornado occurred in the absence of a thunderstorm. Regardless, rotation was evident in a line of heavy showers as it moved through overnight. Concord, MA was the hardest hit, with many reports of downed trees and power lines; a tree limb even flew through a window of a home, and another fell on the roof of a house. Base velocity often shows areas of outbound (reds) and inbound (green) winds relative to the radar. When high values of greens and reds are next to each other, this is often referred to as a velocity couplet, and can be indicative of a tornado. 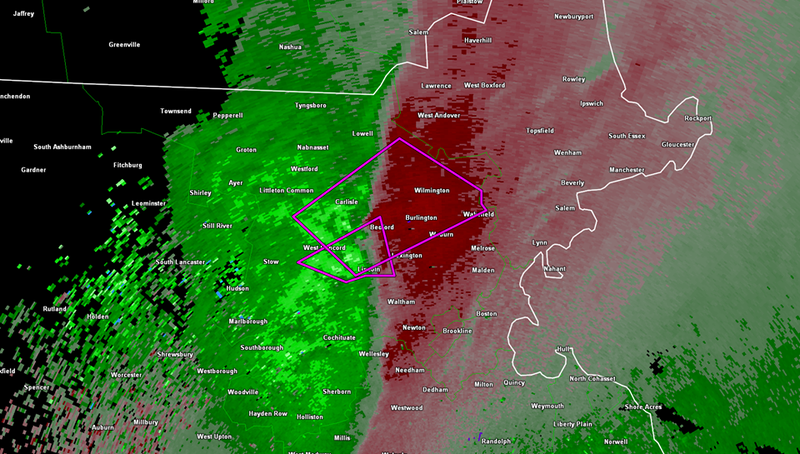 The image above shows the velocity couplet that resulted in the Concord, MA tornado on August 21st. Image courtesy of the Boston, MA National Weather Service.